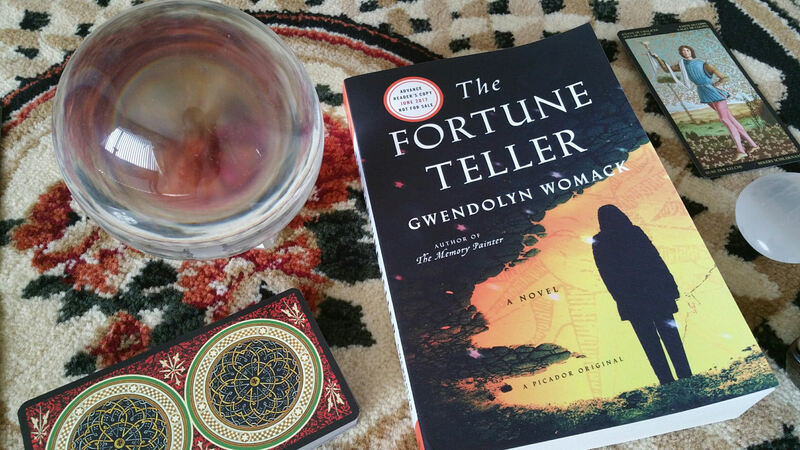 Gwendolyn Womack’s The Fortune Teller, which was released earlier last week (June, 2017), is one of my favorite novels to make reference to tarot. It is the story of a woman who unlocks her heritage as a seer, tracing her roots back to ancient Alexandria, and in doing so, reveals the origins of the tarot. We follow the characters across many continents, countries, time periods, and delightfully, historic figures and fictional interact. 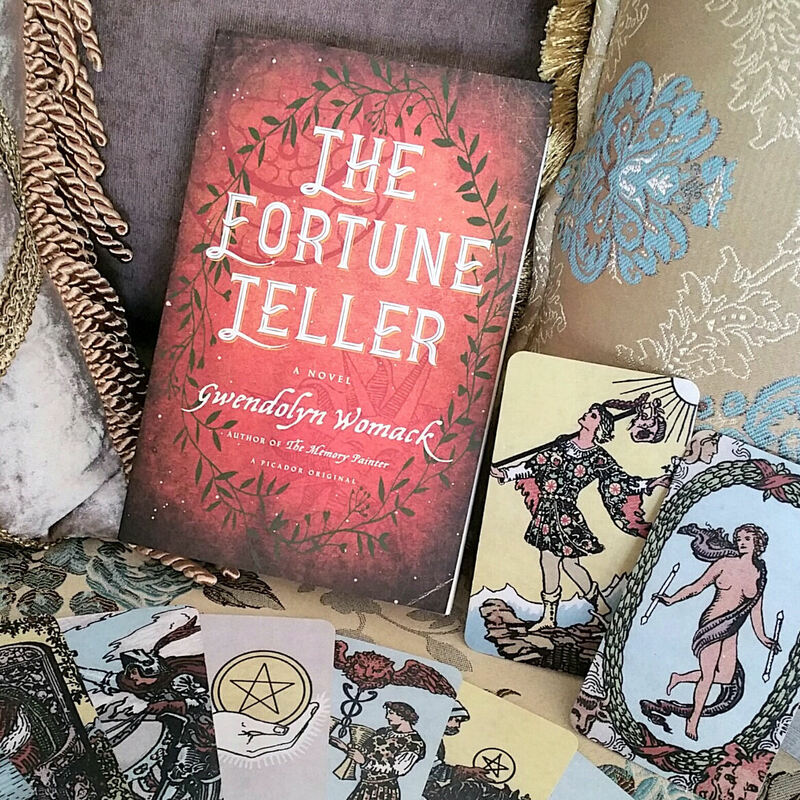 Tarot enthusiasts of all stripes will enjoy this novel and I highly recommend that you add it to your summer reading list. Spoiler Alert: In this review I’ll highlight the key features of the novel and what I loved about it, though in doing so, may give away a couple of spoilers. I promise it won’t take away from the ending or the enjoyment of reading this book for yourself. In a chapter titled “The Fool,” the novel opens with the death of Marcel Bossard, a collector of old manuscripts. In “The Magician,” we are introduced to our main protagonist, Semele, who meets Marcel’s son, Theo Bossard. Semele is instantly attracted to Theo, though there is a professional relationship to maintain–he is her client and she has been assigned to oversee the auction of Marcel’s personal effects. That and Semele is dating a city college English professor, Bren. Yet in going through Marcel’s collection, Semele comes across an ancient manuscript that addresses her, Semele, by name. The ancient manuscript dates back to the times of Cleopatra, written in Alexandria, Egypt by a young woman named Ionna Callas, daughter of Phileas. Her father Phileas is a librarian and respected scholar at the Library of Alexandria. As Semele translates and reads the 2,000 year old manuscript, it in effect begins to talk back at present day Semele, even warning her of danger. 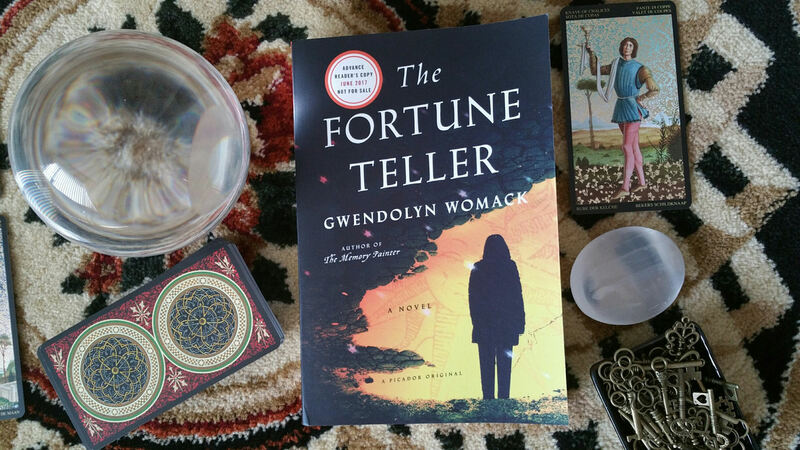 The reader is immediately gripped with the thrill of mystery and Womack’s The Fortune Teller becomes a heart-pounding page-turner. The book follows a nonlinear structure where chapters of present day narratives following Semele and Theo are titled by tarot card names and chapters that are flashbacks into the distant past, from Egypt to Persia to France, are titled by the lemniscate or infinity symbol. There are also single-page snapshots of text messages going back and forth with a mysterious “V.S.,” who will later be revealed as the story’s main antagonist. Womack weaves with seamless precision narrative threads from the past, the present, physical reality, and digital reality together in a way that transcends space-time and yet, remarkably, is easy for a reader to follow. At no point was I confused about what was happening, where it was happening, and who the characters were, which speaks unequivocally to Womack’s writing talent and command of technique. As the novel progresses, we find out that Semele is a direct descendant of a powerful Egyptian seer who receives a set of symbols from the Oracle of Wadjet and the more that a seer works with those symbols, the stronger her abilities to divine the future becomes. Wadget is one of the oldest goddesses in the Egyptian pantheon, a protection deity associated with the serpent. Womack’s prose is rich with memorable one-liners. “The future [has] a course, yet our lives [remain] fluid like water, leaving us with a choice in all things.” We learn that straight from the Oracle of Wadjet in a flashback. Through the chapters titled by the lemniscate, we trace the origins of the tarot, first beginning as a set of symbols inherited by an Egyptian seer through the Oracle of Wadjet, then migrating to Baghdad to manifest as a set of hand-painted picture cards from the Mamluks, where the Egyptian divining symbols are merged with cards that “came from the high steppes of Mongolia,” and also come into the hands of a Roma witch, another one of Semele’s ancestors. The cards then become “caught in the current of time like a piece of driftwood” (quoting the book to showcase Womack’s beautiful prose). A chapter in the book titled “The Hanged Man” gives a fun nod to tarot history. Ingeniously, the book in effect pokes fun at itself, where the characters themselves dispel the myth that tarot cards came from Egypt, sourcing the cards instead to renaissance Italy, and in a mocking way, references Antoine Court de Gebelin, known by tarot historians as the one who popularized the theory that tarot came from ancient Egypt. In one of the final chapters titled “King of Swords,” we learn of the identity of “V.S.,” the antagonist throughout the novel and his motivations for going after Semele and Theo. Red herrings abound and you’re left with much respect for Womack as a master storyteller. Although I wasn’t surprised by the ending, it was at once satisfying and gives closure to the story, which a reader can appreciate. Concomitantly, the novel ends on references to The World card in tarot, bringing together both the cards in their role within the story and Semele’s inheritance but also in the chapter by chapter structure that Womack has set up for us. The World card in tarot is “the symbol of the soul becoming conscious of the divine,” a reference made just as Semele comes to learn of her own legacy as a hereditary seer. Interspersed throughout the novel are psychoanalytical and divinatory arts such as graphology (handwriting analysis), astrology, palmistry, crystal ball scrying, and even vision questing in caves. Womack delights the history nerd with obscure mythological references and even historic holy sites, such as Mount Starius, now the site of the Church of Saint Peter in Turkey. There’s even archaeological commentary, such as when Theo gives a lecture on the importance of modern day digital preservation, comparing digital files to papyrus and parchment. The flashbacks into the past outshined the present day Semele narrative. While I loved Semele’s ancestors, Semele herself felt like a flat, one-dimensional character. By and large, the present day characters fell flat. It’s Ionna, Elisa, Rabka, Simza, and Aishe that came alive for me and were the story’s true protagonists. Had Womack framed the story arc around Ionna, with present day Semele as the secondary character, the book would have been stronger. The love-story aspects of the novel also felt awkward to me and were uninteresting, reading more like sub-plots tucked into the story line as an afterthought. The love-story parts weren’t necessary and I confess skipping over most of those passages, so I guess technically I’m in no position to critique those parts…since I didn’t read all of it. 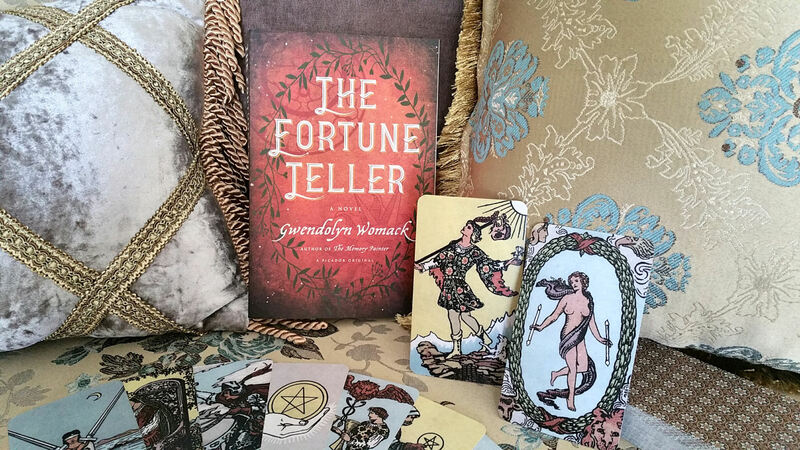 The Fortune Teller is a symbiotic blend of historical fiction, mythology, occultism, New Age theories, and a fast-paced adventure/thriller novel. The author cites well-known texts on tarot history and origins as her sources of inspiration, including Dean Radin, Michael Dummett, Ronad Decker, Thiery Depaulis, and Mary Greer. Womack is the Dan Brown for the tarot world. 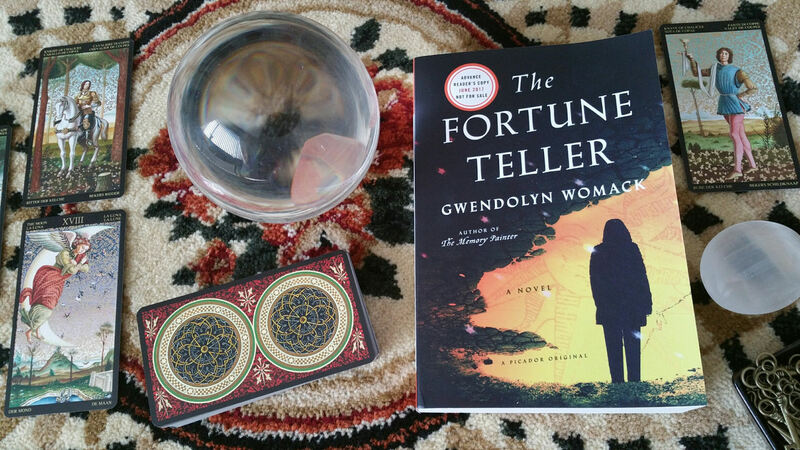 The Fortune Teller is a luscious and enchanting read. I highly recommend. FTC Disclosure: In accordance with Title 16 of the U.S. Code of Federal Regulations Part 255, “Guides Concerning Use of Endorsements and Testimonials in Advertising,” I received The Fortune Teller from the publisher for prospective review. Everything I’ve said here is sincere and accurately reflects my opinion of the book.